Dakar is the caipital an lairgest ceety o Senegal, locatit on the Cap-Vert Peninsula, on the kintra's Atlantic coast. Its position, on the wastren edge o Africae (it is the wastrenmaist ceety on the African mainland), is an advantageous departure point for trans-Atlantic an European trade; this fact aidit its growth intae a major regional port. Accordin tae December 31, 2005 offeecial estimates, the ceety o Dakar proper haes a population o 1,030,594, whereas the population o the Dakar metropolitan aurie is estimatit at 2.45 million fowk. 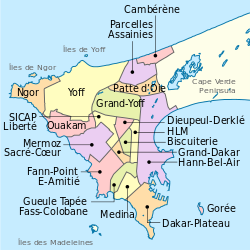 Dakar is a major administrative centre, hame tae the Naitional Assembly o Senegal an Senegal's Preses's Palace. ↑ "DC Sister City Relationships". The District of Columbia. Retrieved 6 April 2012. Wikimedia Commons haes media relatit tae Dakar. This page wis last eeditit on 12 Februar 2018, at 00:41.